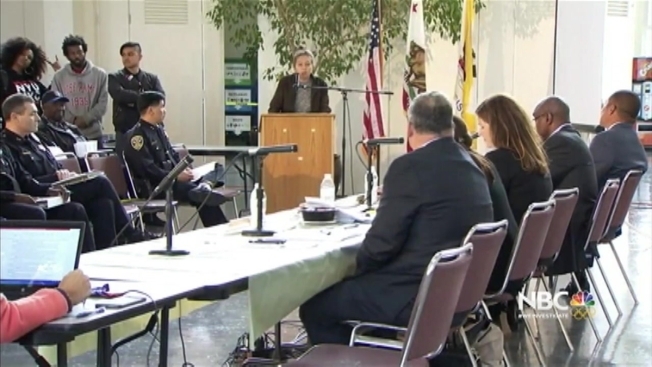 A San Francisco Police Commission meeting Wednesday was cut short after the public comment session got out of hand and the president was forced to adjourn. The meeting was held to discuss a proposed new policy in the Police Department that would for the first time provide clear rules for officers on when to use of force and what level of force to use. It began with a statement from police Capt. Jack Hart. "The San Francisco Police Department's highest priority is safeguarding the sanctity of all human life," he said. When the public comment session began, emotions got the best of some people. "Cops should never shoot at someone running away regardless of their crime," one man says. "What kind of consequences will you have if you fail to use minimal force? asked another man. Then the comments quickly turned into insults. "They just want your two minutes so they can keep going with what they wanted in the first place," a woman shouted to the audience. Yet another man said: "I don't know how you sleep. You all have blood on your hands." When it appeared the outbursts were elevating, commission president Suzy Loftus opted for a recess. After the brief intermission, the meeting resumed, but it didn't last much longer as infuriated residents continued to lash out. May Wang came to talk about the new police policy. She was never heard. Acting Chief Toney Chaplin said he talked to a few people from the community, and they're upset that they never got a chance to communicate what their issues were. The police commission has two more public meetings on use of force planned.